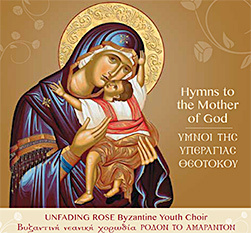 Since the name of our choir, UNFADING ROSE, was inspired by the Akathist Hymn to the Theotokos, this CD owed to be dedicated to her who is the bridge between Heaven and Earth. We tried to include the most beloved hymns to our Most Holy Lady from many different services. AKATHIST HYMN: To Thee the Champion, My Mouth Shall I Open, Unfading Rose, Awed by Thy Beauty. PARAKLESIS SERVICE: All Those Do You shelter. NINTH ODE OF KATABASIES: Magnify O My Soul, O Theotokos Thou Hope, The Angel Cried Aloud. DIVINE LITURGY: Through the Intercessions, It Is Truly Right. THE POEM of St. Nektarios “O VIRGIN PURE IMMACULATE” despite not belonging to any particular Church service, was included within this collection as Christians from all over the world have found in this hymn a warm expression of their love for the Theotokos. It has come to be one of the most popular hymns to our Panagia. 01. Τῆ ὐπερμάχω. Ἦχος πλ.δ΄ Your browser does not support the audio element. 02. To thee, the Champion Leader. Plagal Fourth Mode Your browser does not support the audio element. 23. Θεοτόκε ἡ ἐλπίς. Ἐν νόμῳ σκιᾷ. Ἦχος γ´ Your browser does not support the audio element. 24. O Theotokos thou hope. In the shadow. Third Mode Your browser does not support the audio element. 27. Ἁγνὴ Παρθένε Δέσποινα, Ἦχος πλ. α´ Your browser does not support the audio element. 28. O Virgin pure. Plagal First Mode Your browser does not support the audio element. © 2009-2017 Unfading Rose. All rights reserved.